Pyrex Annular Edge Glass. No longer available. Pyrex® Brand 7740 3/4″ Annular Edge glass is no longer produced by Corning manufacturing company due to the shutdown of the Sunderland, England manufacturing plant. This announcement was made by Corning and anticipates not being able to produce Pyrex® Rolled Sheet, Pyrex® Sight Glass, reflectors or lens covers. 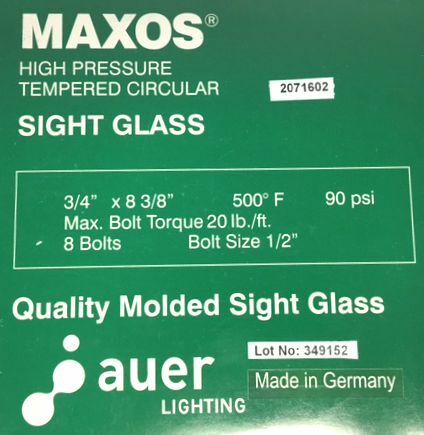 The only replacement for Pyrex® brand Annular edge sight glass is the Maxos® molded replacement circles. 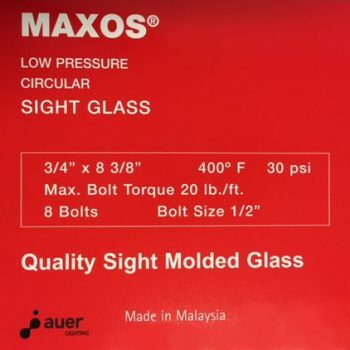 The Maxos® sight glass is molded for formulated borosilicate 8488 glass which in comparison gives a superior quality of cut and ground glass. Maxos® also has a 3/4″ uniform thickness throughout as compared to the 5/8″ minimum thickness of Pyrex® annular edge. The extra thickness gives boiler operators extra safety for their application. 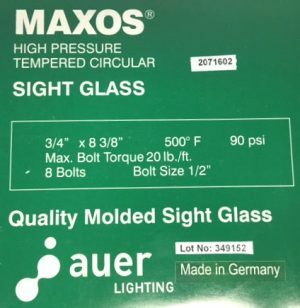 The molding process that Maxos® molded replacement glass goes through produces a uniform product with outstanding optical clarity and greater thermal shock resistance. Testing procedures subject the glass to 8 times its rated pressure for maximum user safety.